AAI took me from a novice climber to someone who can confidently climb anywhere. The summits are great, but the best part of the climbs is the experience of working with the guides who are knowledgeable, experienced, and a great deal of fun. As with many outdoor adventures, especially ones involving diverse groups, there are many challenges. AAI does a great job of addressing these and making it all work. Looking forward to many more climbs with AAI! The 13 Day Mountaineering course is the most comprehensive course we offer and is an incredible opportunity to learn basic mountaineering skills, rock climbing techniques and advanced alpine climbing topics in the North and Central Cascades. This course essentially combines the 6 day mountaineering course, the 5 day rock climbing for mountaineers course and many aspects of our 8 day intermediate course as well. The North Cascades are unique in that they provide the ideal training ground among a variety of readily accessible terrain. 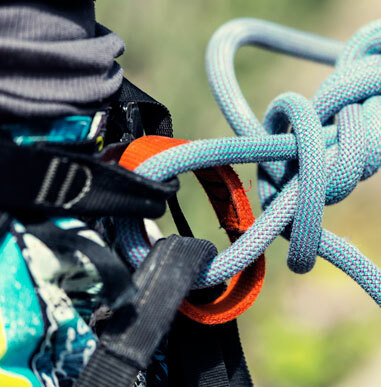 This is a challenging and arduous course, however, it will leave the student with a great skill set in which to help facilitate their climbing career. Whether that be guided or unguided; the 13 Day will certainly provide a great education and leave a lasting impression. Our first six days are usually spent on Mt. Baker, and then we move to a rock training area (generally Leavenworth, WA). Then we plunge deep into the Cascades Range for a final summit attempt. 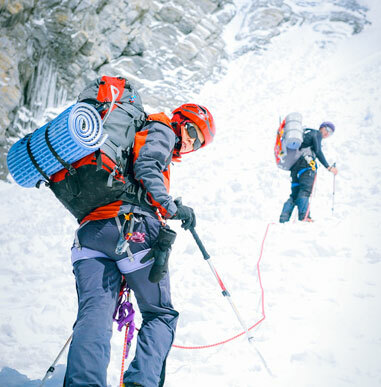 This program will include two challenging summit attempts on varying terrain. This course serves as a prerequisite for many of Alpine Ascents’ intermediate-level climbs and is a stepping stone to more technically difficult climbs. This course has been successfully used as a training ground for skilled adventurers, rangers, law enforcement, firefighters, military, stunt people and many others who need climbing skills to do their work. These courses take place on Mt. Baker, Mt. Daniel, Eldorado Peak, Sahale Peak and throughout the Cascades. We use a variety of locations to provide pristine, less populated environs for our training. That also enables us to take advantage of the best possible mountain conditions for each course. The North Cascades in Washington state form the largest and most rugged alpine wilderness mountain range in the contiguous United States. Contained within this range are scores of peaks topping 8,000 feet, upwards of 400 glaciers, and countless permanent snowfields. Most of the high peaks in the North Cascades are composed of metamorphic or intrusive igneous rocks. These weather-resistant rocks have been heavily sculpted by alpine glaciation, producing stunning peaks and ridges. These breathtaking views and the wide variety of alpine climbing have earned the area the nickname “The American Alps.” The North Cascades are considered the premier training ground for developing alpine climbers. See our Course Catalog for a complete listing of our North Cascades course offerings. The weather in the North Cascades can be extremely variable, with snow below 3,000 feet. Precipitation levels are heavy, particularly during the winter months. “Variable conditions” also include glorious weather for lengthy periods, usually in late summer. For instructional purposes, the optimum time to climb in the Cascades is from early May through late August. This is when the combination of weather and snow conditions is usually at its best. The vegetation and wildlife of the North Cascades are interesting and diverse. Approximately 150 common species and another 100 or so less common species of wildflowers bloom during the summer. This range is aesthetically exceptional and we hope you find yourself returning many times to enjoy its grandeur. Many who have been introduced to the world of alpine climbing in the Cascades have gone on to climb in the world’s greatest mountain ranges. We hope our program will be the first step towards a lifetime of mountaineering. Mt. Baker (10,781 ft.), the highest point of the North Cascades, is a heavily glaciated dormant volcano. The twelve active glaciers of Mt. Baker cover an area exceeding 20 square miles. Mt. Baker is unique in its great mass of snow and ice and easy accessibility. This combination creates a perfect alpine training ground. El Dorado Peak (8,868 ft.) is one of the most majestic North Cascades mountains. It presents a strenuous climb, which rewards the physically fit with a beautiful mountaineering route. It is perhaps the most intensive training ground we use. General snow and glacier climbing skills lead one to the knife-edged snow arete at the summit and an expansive view across one of only two ice caps in the North Cascades. The aptly named Inspiration Glacier cloaks the summit and is magnificent to behold. Mt. Daniel (7,986 ft.). A scenic hike on the Pacific Crest Trail and a timberline high camp near a beautiful glacier tarn enhance the approach to this little-known glaciated peak of the Central Cascades. This is a complex mountain requiring a broad range of basic mountaineering skills. Sahale Peak (8,680 ft.) presents another classic North Cascades wilderness mountaineering objective and is a favorite among our guides. Climbers are rewarded with some of the best scenic views in the range. The corniced rock and snow summit ridge rises above the small, steep Quien Sabe Glacier and provides an aesthetic climbing line that’s accessible with basic skills. You should aim to be in the best shape of your life. The weight of your pack is generally 65 pounds. We invite you to check out our comprehensive Training page. We highly recommend checking with your physician before embarking on strenuous physical activity. We reserve the right to turn away those climbers who we determine to be in inadequate physical condition. Please review the Sample Menu Plan. As part of the curriculum, you are responsible for your own food. Before departing for the trailhead, we will check and organize personal/group gear. Additionally, if necessary we will make one final stop for groceries. However, it is advisable to purchase most of your bulk foods before we meet. If you are staying in Seattle, there are numerous supermarkets as well as the flagship REI, North Face, and Patagonia gear shops for fresh and prepackaged foods. You will get far more out of your course by reading Mountaineering: The Freedom of the Hills, 6th ed., The Mountaineers. This book provides an excellent overview of the elements involved in alpine mountaineering. Chapters 1, 2, 3 and 6 review many of the.phpects we will be covering during your training and familiarity with these.phpects will greatly enhance your experience. Our Washington 6-Day courses take place on Mt. Baker, Mt. Daniel, El Dorado Peak, Sahale Peak, Glacier Peak and throughout the North Cascades. We utilize a variety of locations to distribute land use throughout the North Cascades and provide pristine, less populated environs for our training. Our 13-Day course also includes mixed climbing areas such as: Mt Shuksan, Twin Sisters, Forbidden, Mt Sloan, Torment, Buckner, Logan, Chair Peak, The Tooth and Guy Peak. All courses take place in the mountains. Our 8-Day and 12-Day Alaska programs take place in Denali National Park in the environs of Denali itself on the South East Fork of the Kahiltna Glacier. Upon registration, we will send you detailed information about your course, such as the menu plan below. The 13 Day Course combines backcountry and car camping. The food planning information below is weighted towards backcountry dining. The foods recommended for backcountry lunches will also work great for day trip climbing. As per the itinerary, you will be “in the field” for the first 5 days/4 nights and the last 3 days/2 nights of the course. The remaining 5 days of the course will be spent in campsites where it’s a short drive to town to eat at restaurants and purchase food at grocery stores. Meals during this portion of the course are generally very simple versions of what you cook at home. It will be easy to pick up the food you need at many times during the course. Nourishment and mountaineering are inseparable for those who wish to successfully enjoy mountaineering. Climbing requires higher daily energy expenditure than most other strenuous activities. Eating well and frequently sustains energy levels and keeps us happy as well as helps us to combat the cold conditions and inclement weather we will likely encounter in the Cascades. One of the most challenging parts of a mountain guide’s job is discussing and advising our climbers on the types and quantities of food to bring on a mountaineering expedition. Unlike clothing or sleeping gear where climbers simply have or don’t have an adequate item, food is somewhat subjective. Going hungry and/or having to live off the extra food of other climbers and guides is not fun. Consider the weight and volume of what foods you are bring. A block of cheese is easier to pack than a similar amount weight of shredded cheese because it is denser. Dehydrated meals are the lightest meals to pack and easiest to prepare, but if you don’t’ like them it doesn’t really matter how light and easy they are. Six days is a long time to be unhappy with your food choices. If you don’t like a particular food in your home, it is unlikely you are going to start enjoying it in the mountains. Is 1 cup dry cereal with 3 tablespoons of powdered milk enough for one breakfast or will you be happier with 1.5 cups? How much pasta should you bring for one dinner…2 packets of instant oatmeal or 3? Trying out a few mountain meals at home will give you a much better sense of what to bring. Test out snack/lunch options before your course. Salt, pepper, mustard, hot sauce, sugar, etc. are all great additions to any meal plan, especially if you are not using dehydrated meals (as they are already very high in sodium). The lightest option is to pick up individual serving packets from the deli section at the grocery and store them in a Ziploc bag. Also, very, very small (1 oz.) plastic storage containers with screw-on caps can be purchased at most outdoor stores for condiment storage. An essential part of breakfast and dinner for both hydration and well-being. Coffee drinkers take heart – there can be decent coffee in the mountains! 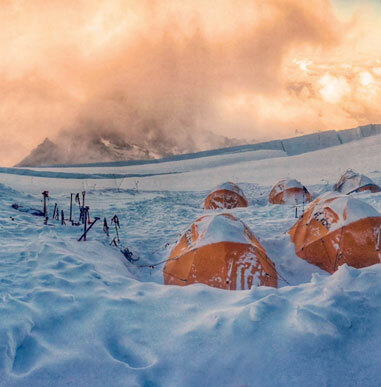 Starbuck’s VIA’s have become the new standard on mountaineering expeditions. A small portion of powdered milk and sugar can be added to preference. Black tea, yerba mate, herbal teas, hot chocolate and powdered chai are other options. Plan on bringing enough for 2 to 5 hot drinks per day! Meats and cheeses are great foods for this course as they will not spoil due to cold temperatures. Reduce excess packaging. Get rid of boxes, extra wrapping, etc. Ziplocks are great for repackaging food. A few medium sized stuff sacks are great to help organize food while in camp. Good luck and have fun experimenting with your menu plan. See you in the mountains, Bon Appetit! You may want to consider bringing Nuun active hydration tablets or other cold drink mix to add into drinking water for electrolyte replacement during your course ****Please note the emphasis on hot drinks and other liquids in the menu. Staying hydrated while climbing is very important, and this issue is addressed in-depth while on the course. Having a hot breakfast is important, especially in cold weather environments. Most climbers go with instant or quick cooking hot cereals like oatmeal or Cream of Wheat, or dry cereals and powdered milk mixed with hot water. All of these meals taste better and provide more calories when fortified with dried fruits, nuts, honey, butter, even chocolate chips! Tastier (and heavier!) breakfast ideas are included below. For your course you should have 5 breakfasts. About half of these should be basic meals to carry higher on the mountain and the remaining can be more luxurious meals at the beginning if the trip when we are lower. Don’t forget your Hot Drinks! Lunch begins just after breakfast and ends just before dinner. It is the most important meal of the day and needs to have enough variety to keep you happy over 6 days. Continuous eating of small quantities will keep up your energy levels for the whole day, especially on big travel/summit days where we will be on the move for 8 hours or more. For your course you need lunch food for 8 days plus 5 days of roadside climbing. Determining the amount of lunch food to bring is difficult to gauge on your first mountaineering expedition. General guidelines are given below. The rule many guides work with is the weight of your lunch food should be equivalent to weight of your breakfast and dinner food added together. – GU’s, Cliff Shots, etc. For the greatest preparation and cooking ease, freeze-dried food is an option. Usually, these foods only require that boiling water be added, and can be eaten within minutes. Often the packaging serves as heating container, and the meal may be eaten from it; thus there are no pots/bowls to clean. However in cold or high altitude environments following manufacturer’s recommendations is often not sufficient to fully reconstitute freeze-dried food. Other downsides of freeze-dried food are the cost, usually an increase in garabge which must be packed out, lack of flavor, etc. We recommend for only slightly more effort but vastly reduced cost, any supermarket can be tapped for a wide variety of easily prepared foods. Items such as Knorr rice or pasta entrees in envelopes cook in 5 to 10 minutes, and are very tasty. (There are many other brands available). It is best if you experiment ahead of time at home, so that you know which you prefer. For those with a culinary creative streak, very tasty meals can be made up from scratch with only a minimum of additional effort. Items such as quick brown rice, quick or instant white rice, bulgur, instant precooked and dried beans, dehydrated vegetables, packaged or bulk sauce mixes, smoked salmon, exotic cheeses and whatever spices and herbs you like or want to experiment with can be prepared in excellent combinations. You will need 6 backcountry dinners for your course. Many guides bring a soup packet, like instant miso soup, for each meal (unless the meal is already soup based). This makes a great pre-dinner hot drink and helps keep us on top of our hydration. Don’t forget your Hot Drinks! Basically you want something sweet to have as you sit around after dinner, enjoying the scenery. Some people consider sweet hot drinks dessert, while others bring instant Jell-O pudding (a half package is enough for one dessert), cookies, or candy, or chocolate. Jell-O no bake cakes or specialty cookies can also make a great dessert. I think the greatest strength of the company was reflected in this course and in every trip I’ve done with Alpine Ascents; and that is the guides. My guides were 100% fantastic. They were truly impressive in regards to both their skills and knowledge as well as their interpersonal skills.